Beautifully engraved Certificate from the Tramways & Electricite de Constantinople issued in 1916. 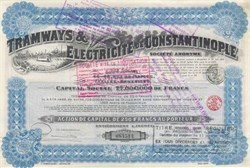 This historic document has an ornate border around it with a vignette of a electric train with the City of Constanotinople in the Background. This item also has interesting liquidation stamps on its face. This item is hand signed by the company's administrators and is over 84 years old.